In addition to the mRNA template, many other molecules contribute to the process of translation. However, the general structures and functions of the protein synthesis machinery are comparable from bacteria to human cells. Translation requires the input of an mRNA template, ribosomes, tRNAs, and various enzymatic factors (Figure 6). Ribosomes are the part of the cell which reads the information in the mRNA molecule and joins amino acids together in the correct order. In E. coli, there are 200,000 ribosomes present in every cell at any given time. A ribosome is a very large, complex macromolecule. Ribosomes are located in the cytoplasm in prokaryotes and in the cytoplasm and endoplasmic reticulum of eukaryotes. 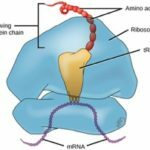 Ribosomes are made up of two subunits that come together for translation, rather like a hamburger bun comes together around the meat (the mRNA). 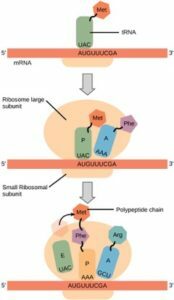 The small subunit is responsible for binding the mRNA template, whereas the large subunit sequentially binds tRNAs, a type of RNA molecule that brings amino acids to the growing chain of the polypeptide. Each mRNA molecule can be simultaneously translated by many ribosomes, all synthesizing protein in the same direction. Figure 7: Translation begins when a tRNA anticodon recognizes a codon on the mRNA. The large ribosomal subunit joins the small subunit, and a second tRNA is recruited. As the mRNA moves relative to the ribosome, the polypeptide chain is formed. Entry of a release factor into the A site terminates translation and the components dissociate.